Numerous options are available with shipping ocean freight to Puerto Rico, either by a LCL (Less than Container Load) or FCL (Full Container Load) shipping service. FCL is considered easier because the container is the package. It’s less of a logistical challenge than moving a smaller LCL shipment where packaging and reliance on a common carrier/trucker (to pick up and deliver your goods to a dock for re-handling into a container) may become crucial. There are a variety of carriers that will move your container to Puerto Rico including ocean carriers who actually own or operate the vessels, freight forwarders, and Non-Vessel Operating Common Carriers (NVOCC’s). There are also household goods movers who are used to move your freight depending on whether it is a business to business (B2B) move, a business to consumer (B2C) move or a household goods/personal effects shipment. Pricing can depend on whether it’s a one-time shipment or a series of commercial shipments, as well as how pricing is negotiated with the shippers. There are also rail options depending on where the origin of the move is, trucking options and seaport options. To quickly help you with logistics-related shipping, call a freight forwarder, like DGX-Dependable Global Express, and ask about all the options available to you. For LCL, many service options exist but they are mostly limited to freight forwarders and NVOCC’s. What makes DGX unique? We ship directly off the West Coast to Puerto Rico via Jacksonville FL. Others may ship over to Panama and then to Puerto Rico, but as a result, the origin of the freight changes from USA to Panama which means upon arrival into Puerto Rico, your shipment is treated as a non-USA shipment for duty purposes. By shipping via DGX from the West Coast, trucking and related costs to Florida or Houston can be avoided. Another benefit: the merchandise is handled fewer times in and out of containers and trucks. Many U.S. based shippers exporting to Puerto Rico need to file AES (Automated Export System, when applicable). 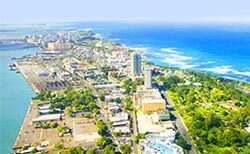 Since Puerto Rico is considered a USA territory, many do not realize a AES filing is necessary, however all standard AES filing requirements and policies apply. Importers and consignees also need to provide their BRN (Business Registration Number) also known as the MRN (Merchant Registration Number). Vessel vs. barge? FCL service to Puerto Rico (via Jacksonville, FL) is offered by DGX via two services, vessel and barge. Vessel shipping has a shorter transit at a higher cost. Barge is also available with longer transit time but at a more competitive rate. Logistically, your shipment of a West Coast FCL primarily consists of loading onto a domestic trailer for pick up. Trailers are then moved via rail to the DGX Jacksonville FL’s Container Freight Station (CFS) where the cargo is trans-loaded onto direct ocean carrier equipment. You always have shipping options to consider. One of your goals should be to educate yourself on all options to determine which best suits your needs. Another goal is to select the company that can best handle your shipment. DGX stands by ready to answer all your questions and can deliver on all your shipping needs. Call DGX today at 888.488.4888 U.S. Toll Free or 310.669.8888 Local.